I also got all of the half square triangles cut for my June Simply Solids block, now I just need to actually put them together, and quickly- this will be an Inverted Star Block. And finally, I cut and sewed a couple of blocks for the start of my own bed quilt, it's a low volume background, and high volume plus block, from the Marcelle Medallion Quilt, just the plus blocks, I've been itching to get started for a long while- and I needed to scratch this itch. 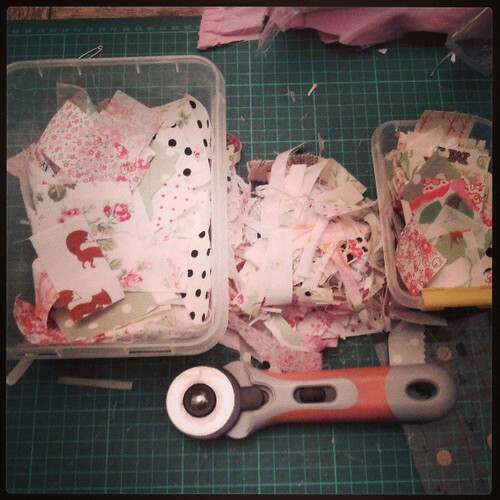 Now, after a marathon cutting session last night, this must be put aside, whilst I finish my bee blocks and a few little things for Retreat, which is just about 3 weeks away! Oaft, that's a LOT of cutting! You've been a busy bee, though. That is going to be the cutest name badge!! 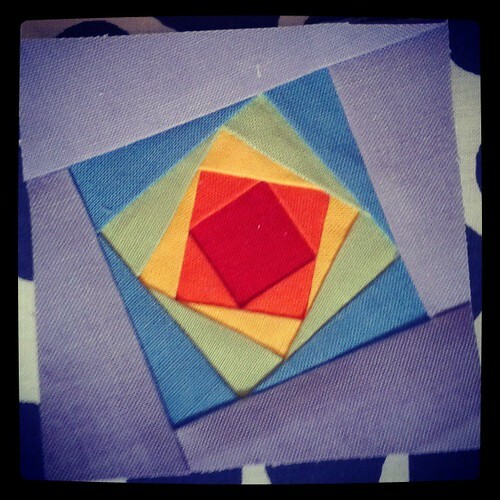 Love your projects with solids. 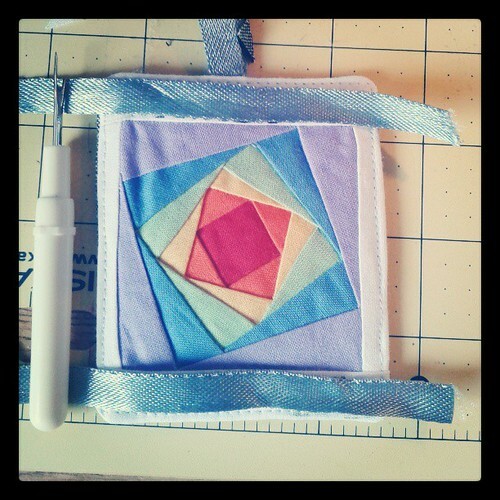 Love your square in square badge! 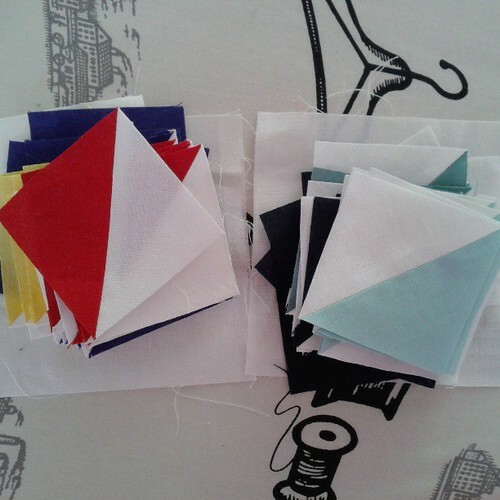 What size are the bed quilt squares? Maybe the name tag could be removable and she could use it for her keys after the retreat? Boy, have you been busy! I adore that rainbow square in a square. Nicely done! Looking forward to your progress on the Plus blocks. Love that name badge - it's going to be a very lucky owner! 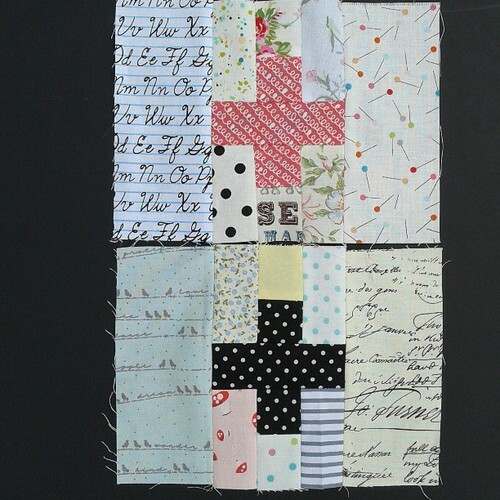 The plus blocks are really cute - it's going to be a fabulous quilt when it's done. I'm starting to panic about FQR prep at the moment....!!! 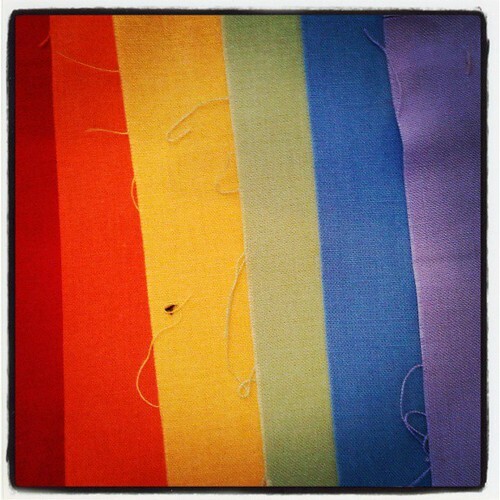 Love this rainbow square in square! I definitely know one person who would love that badge but I think she has a lot on her Flickr so it must be for someone else. Lucky lady whoever it is! love your blocks! the rainbow one is my favorite! You should hop over and link up to Needle and Thread Thursday! I'm so glad you decided to link up! Whoever receives that name badge is certainly lucky! You've definitely been busy! The rainbow tag should make anyone seeing it smile. And the + blocks are lovely! Beautiful name badge:):) Love,love the low volume blocks. I want one! That name badge is adorable. She will love it I am sure. You've been a busy bee. Now enjoy a well earned beach break! that name badge is ace! it would make a fab quilt. A bit bigger, obviously! I have some button ribbon if you want some? I'm assuming you sorted it now. My partner has 1 flickr pic, and 1 blog post from 3 years ago. Talk about challenging! It's All A Bit More Real Today.